Note: An updated post with figures on 2016 births to unauthorized immigrants was published in November 2018. The decrease in births to unauthorized immigrants from 2009 to 2014 contrasts with the trend for the U.S. unauthorized immigrant population overall, which has stabilized. 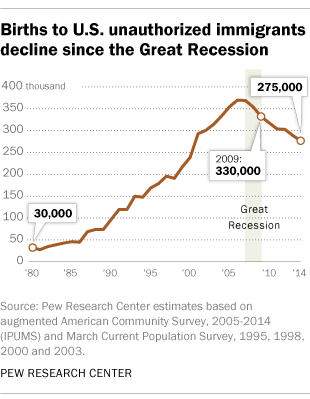 The number of births and the total population both generally rose through the 1990s and 2000s, peaked in 2006 (births) or 2007 (population), and then declined as the recession of 2007-2009 lingered. About 11.1 million unauthorized immigrants lived in the U.S. in 2014, according to a Pew Research Center estimate. They made up 3.5% of the nation’s total population, but accounted for a higher share of births because the immigrant population overall (lawful and unauthorized) includes a higher share of women in their childbearing years and has higher birthrates than the overall U.S. population. These estimates are based mainly on data from the U.S. Census Bureau’s Current Population Survey and its American Community Survey, using the widely accepted residual methodology employed by Pew Research Center for many years. These new estimates update and revise previous estimates for 2012 (310,000 previously; now 305,000) and 2013 (295,000 previously; now 290,000) based on more detailed data sources. A separate Pew Research Center report released today, which examines trends in births to all foreign-born women, finds that these births are driving growth in U.S. births overall. The report also looks at characteristics of immigrant mothers, and finds that a rising share of births to immigrant mothers are to those who are married. Most children of U.S. unauthorized immigrants were born in the U.S., making them U.S. citizens. The 14th Amendment to the U.S. Constitution, adopted in 1868, grants an automatic right of citizenship to anyone born in the United States. Most Americans (60%) opposed the idea of changing the Constitution to eliminate this right of citizenship, according to a Pew Research Center survey in 2015, while 37% favored changing the Constitution to end “birthright citizenship.” Most Americans (90%) are aware of the constitutional right to citizenship for those born in the U.S. Overall views have changed only modestly since the Center began asking about this topic in 2006. However, views differ by political party, and the gap between supporters of the two parties on this question has widened. By 75% to 23% in the 2015 survey, Democrats opposed changing the Constitution to ban birthright citizenship. Republicans were more split: About half (53%) favor amending the Constitution, while 44% are opposed.